After mustering only one goal in Game 1, the Crimson regrouped for an explosive four-goal second period in Game 2. With seven minutes left in the third period between the Harvard men’s hockey team and Dartmouth, junior forward Ryan Donato threaded a stretch pass to his sophomore linemate Ty Pelton-Byce. The sophomore had snuck behind the Big Green defense; picking up the pass, he switched to his backhand and found the back of the net. On any other night, that goal would have been far more impressive. But the tally was the last of the Crimson’s whopping seven goals in the game. After dropping Game 1 of the ECAC quarterfinals to Dartmouth the day before, 4-1, Harvard needed to come out strong to save its season. 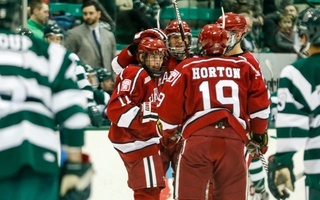 That’s exactly what the Crimson (14-13-4, 11-8-3 ECAC) did, handing the Big Green (16-16-2, 11-10-1) a 7-1 drubbing. 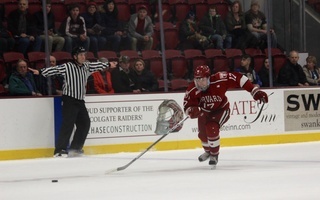 The driving force behind the win was the middle frame’s four Harvard goals. Having already jumped out to a 2-0 lead, the Crimson didn’t stop there. Sophomore forward Nathan Krusko tossed the puck at the pads of Dartmouth senior net-minder Devin Buffalo. While Pelton-Byce and Donato kept Buffalo preoccupied, Krusko found his own rebound and chipped it over the goaltender. 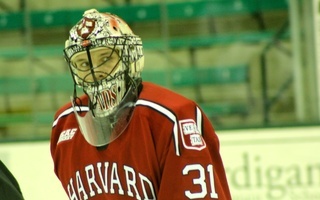 The tally was Krusko’s second of the series—he scored Harvard’s lone goal in Game 1. Soon after, sophomore defenseman Adam Fox joined the party. Twice, Fox found himself with the puck in the slot. Both times, he picked the top-right corner, first with a turnaround shot and then with a wrister. 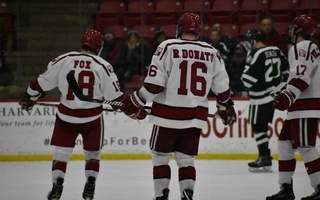 Even though the Big Green tallied in between Fox’s goals, the Crimson did not lose stride, holding onto its 5-1 lead. The teams traded penalties through the game, and Dartmouth sophomore Will Graber received a five-minute major and a game misconduct for cross-checking Donato in the head. Donato didn’t seem the worse for wear though, netting a goal on a different man-advantage opportunity to close out the second period. Earlier, he’d had a goal taken away after the referees judged that Pelton-Byce had interfered with Buffalo during the play. Needless to say, the Olympian was glad to have the tally back to push his team ahead, 6-1. The Big Green switched goalies after the second period, sending out sophomore Adrian Clark for his first postseason start. As sharp as Buffalo had looked the night before, Harvard had its revenge, and the senior left the ice having stopped 23 of 29 shots. Meanwhile, between the pipes for the Crimson, tri-captain Merrick Madsen had a bounceback game after his rough start on Friday, turning away all but one of Dartmouth’s 22 shots (.955 SV%). Special teams came through for the home team, as Harvard finished the night having converted on 2 of 4 power play opportunities and killed off all its five penalties. The Crimson broke the ice on its first man-advantage chance of the game, with junior forward Lewis Zerter-Gossage finding twine from the right circle. Less than 30 seconds later, rookie forward Ben Solin added to the scoreboard, shoveling the puck in past a scramble in the blue paint. Overall, 12 different players notched at least a point on the night. Fox (2–2—4) and Donato (1–3—4) paced the team, and Krusko, Pelton-Byce, and sophomore defenseman John Marino all had two-point games too. The Harvard icemen can leave the rink tonight with the confidence that they played like their season was on the line. With a deciding Game 3 set for Sunday at 5 p.m., the Crimson must summon up a similar offensive explosion to keep its ECAC title defense alive. The last time Harvard entered the ECAC playoffs as the fourth seed was in 2006—after losing its first quarterfinal game, the Crimson came back to take the Whitelaw Cup. The hosts will certainly be hoping that history repeats itself come Sunday. —Staff writer Stuti R. Telidevara can be reached at stuti.telidevara@thecrimson.com. Follow her on Twitter @StutiTelidevara. Want to keep up with breaking news? Subscribe to our email newsletter. The comprehensive resource for navigating the job search, composing strong resumes and cover letters, performing at interviews, using Harvard’s Campus Interview Program, and profiles from alumni in different industries. Leukolab Quincy, a local cell donation center, is encouraging local communities to become involved in biotech research. Harvard Innovation Labs invites you to apply to the Ingenuity Awards! With Gmelius it’s possible to seize every day, no matter how busy you might be. Step Up Your Summer With These Awesome Programs! From one Harvard student to another, don’t miss out on these amazing opportunities! Copyright © 2019 The Harvard Crimson, Inc.